Virtual windows could improve the elderly’s health and emotional state. 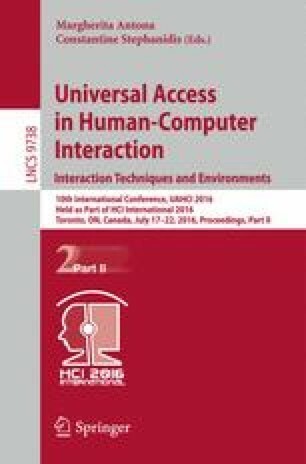 Therefore, this study aims to identify and understand the concept of the virtual window in the elderly’s living environment. To achieve this purpose, this study summarizes the concept of the virtual window for the elderly’s windowless living environment. Then, based on this concept, this study proposes syntheses of the virtual window. The concept of the three syntheses could assist the designers of the visual window in designing a helpful and realistic environment for the elderly and, thus, improve the elderly’s health and emotional state. This work was supported in part by the Ministry of Science and Technology, Taiwan, ROC under Contracts MOST 103-2628-H-182-001-MY2 and 104-2410-H-182-025-MY2, and by the Healthy Aging Research Centre, Chang Gung University (fund no. EMRPD1F0301, CMRPD1B0331, and CMRPD1B0332). The funders had no role in study design, data collection and analysis, decision to publish, or preparation of the manuscript.